This an excerpt from Diana Nelson Jones' Walkabout series from Pittsburgh Post-Gazette. Read the entire article on Post-Gazette.com. 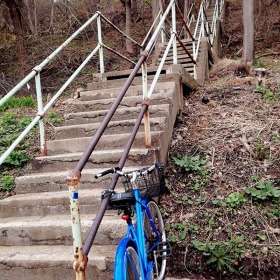 The Joncaire Street steps lead from Panther Hollow up to the driveway behind the Frick Fine Arts Building. They’re what you might call a direct flight — 135 treads not counting landings. Some of the steps and landing planks rock, depending on where your foot lands, but the entire contraption is sturdy enough to remain open while the city devises its plan to replace it. Since nothing happens when the city says it will — not a knock, just reality — don’t take seriously the end-of-2015 projection for the work in Oakland. Working with a neighborhood nonprofit advocacy group, the Oakland Transportation Management Association, the city procured a $384,000 grant from the federal Transportation Alternatives Program to build new steps, add lighting and re-landscape part of the hillside at the edge of Schenley Park. “This is the first time we’ve ever gotten federal money to do steps,” Mr. Hassett said. 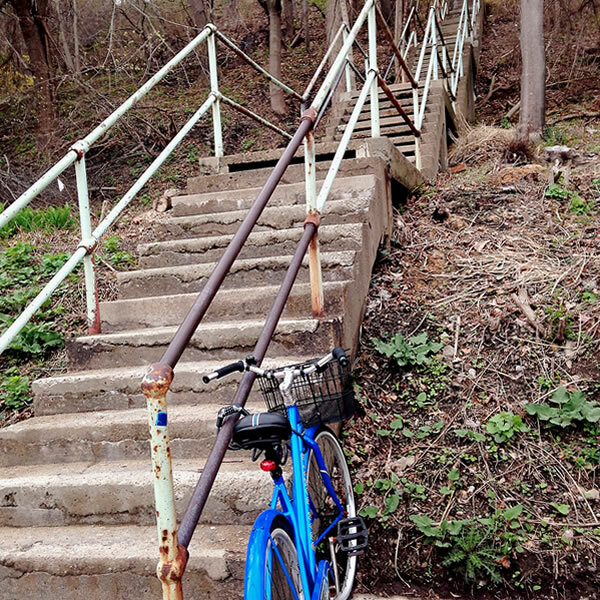 Whenever the project is finished, the steps will be wider and include runnels — flat channels alongside the steps for bicyclists to walk their bikes up and down. To get from Panther Hollow to the center of the University of Pittsburgh’s campus, cyclists now have to somehow navigate the Belgian blocks on Joncaire Street or pedal far out of their way. Mr. Hassett said he doesn’t know how much more money than the federal grant will be needed to complete all of the work. The grant is only for construction. The city is spending another $30,000 for the engineering. Geotechnical assessment of the hillside is soon to be completed, he said. The bicycle amenity as part of the step design is a model for the future as the city repairs and replaces steps.